Max Dupain began to specialise in architectural photography in the late 1940s, having already built his reputation as a photographer working with fashion, commercial still life and portraiture. The aesthetic concerns of modernist architecture resonated with Dupain’s visual syntax. 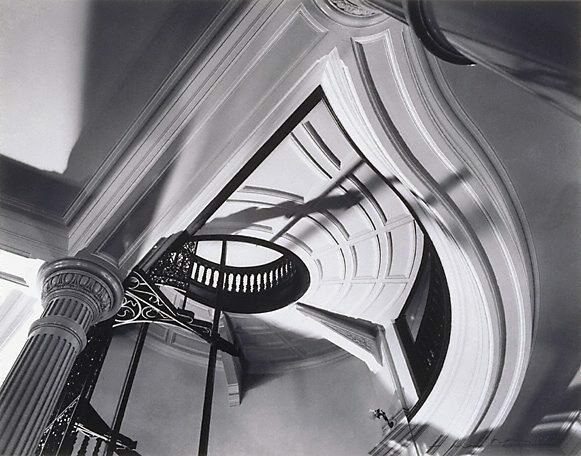 His use of dramatic lighting to delineate space and his penchant for cropped frames and canted angles (as in this photograph of the stairway in the CSR head office) amplified the formal features of his architectural subjects. Signed and dated l.r. image, pencil "Max Dupain '60".